August 13 is marked as Patriots’ Day in the Indian state of Manipur for the execution on that date in 1891 of Prince Bir Tikendrajit. The Kingdom of Manipur numbered among scores of “princely states” — nominally independent tributaries of the British Raj. Part of the deal for these princely states was that the British guaranteed the throne and the succession of the cooperating ruler, but these were pragmatists. 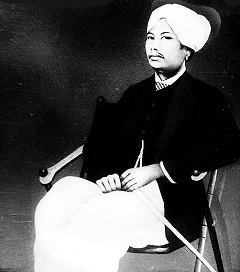 When the warrior chief Tikendrajit deposed Manipur’s raja in the fall of 1890, the British waffled and for several months the revolution appeared to be a fait accompli. Eventually, Lord Lansdowne decided to let stand the resulting transfer of power to the ex-raja’s brother, but do right by their “guarantee” by marching 400-500 Gurkhas into Manipur to demand surrender of Tikendrajit for punishment. This intention met unexpectedly fierce resistance, and Manipuri soldiers eventually overwhelmed the British, slaughtering most of the soldiers as well as the expedition’s leader, J.W. Quinton, High Commissioner for neighboring Assam. Tikendrajit had the honor of commanding Manipuri’s forces in the brief ensuing conflict: the Anglo-Manipur War. It lasted only a few weeks, as the British scaled their punitive deployments up from “token” to “overwhelming” and by the end of April hoisted the Union Jack over Kangla Palace. Tikendrajit was hanged on the evening of August 13, 1891, along with an aged general named Thangal, on the polo grounds of Imphal. Today that place is known as Bir Tikendrajit Park, in honor of a man remembered as a patriotic hero. Three other Manipuri leaders were hanged for the rebellion, and 22 suffered penal transportation. OMAHA, Neb., June 5. 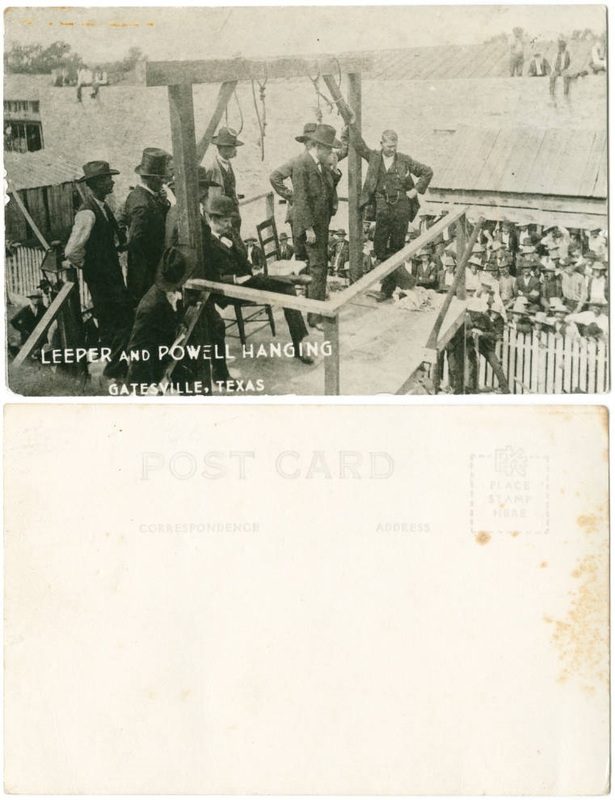 — Charles Sheppard and Christian Fuerst, who murdered Carl Pulsifer Dec. 10, 1889, and then robbed the body of $20, were hanged at Frement [sic] at 10:30 this morning. Sheppard nearly fainted on the gallows, but Fuerst acted entirely unconcerned. When the men were asked if they had anything to say Fuerst replied, “nothin,” but Sheppard said, “We are the men who did the deed and therefore no one else can be accused of it.” Both of the men’s necks were broken. Come and listen unto me. About two men that’s to be hung. For which they had to give their lives. ‘Twas the answer Jim made then. Jim was low and very neat. And their lips did seem to meet. Placed black caps upon their heads. Between the earth and the sky. These two men were made to die. To receive them at their end. Live, oh, live a sober life. ** Actually, Ed Leeper’s mother was a prosperous Tennessee matron who spent liberally on her son’s defense; the men’s appeals, even challenging the legality of the entire Texas penal code, went all the way to the U.S. Supreme Court — quite unusual for the time. But it is correct that they did not have bail: the enormity of the crime, and the fear of inviting a lynch mob, saw them behind bars and under heavy guard from the time of their arrest hours after the robbery. 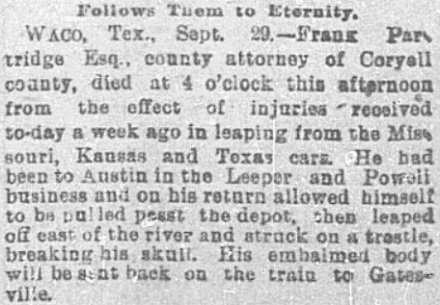 From the Dallas Morning News, September 30, 1891. † Since the attack took place under cover of darkness, nobody could positively identify the assailants. Leeper and Powell, well-known local ruffians, were suspected at once and the suspicion appeared circumstantially supported. On July 27, in the year 1889, the Parisian police were informed of the disappearance of one Gouffe, a bailiff. He had been last seen by two friends on the Boulevard Montmartre at about ten minutes past seven on the evening of the 26th, a Friday. Since then nothing had been heard of him, either at his office in the Rue Montmartre, or at his private house in the Rue Rougemont. This was surprising in the case of a man of regular habits even in his irregularities, robust health, and cheerful spirits. Gouffe was a widower, forty-two years of age. He had three daughters who lived happily with him in the Rue Rougemont. He did a good trade as bailiff and process-server, and at times had considerable sums of money in his possession. These he would never leave behind him at his office, but carry home at the end of the day’s work, except on Fridays. Friday nights Gouffe always spent away from home. As the society he sought on these nights was of a promiscuous character, he was in the habit of leaving at his office any large sum of money that had come into his hands during the day. About nine o’clock on this particular Friday night, July 26, the hall-porter at Gouffe’s office in the Rue Montmartre heard someone, whom he had taken at first to be the bailiff himself, enter the hall and go upstairs to the office, where he remained a few minutes. As he descended the stairs the porter came out of his lodge and, seeing it was a stranger, accosted him. But the man hurried away without giving the porter time to see his face. When the office was examined the next day everything was found in perfect order, and a sum of 14,000 francs, hidden away behind some papers, untouched. The safe had not been tampered with; there was, in short, nothing unusual about the room except ten long matches that were lying half burnt on the floor. On hearing of the bailiff’s disappearance and the mysterious visitor to his office, the police, who were convinced that Gouffe had been the victim of some criminal design, inquired closely into his habits, his friends, his associates, men and women. But the one man who could have breathed the name that would have set the police on the track of the real culprits was, for reasons of his own, silent. The police examined many persons, but without arriving at any useful result. However, on August 15, in a thicket at the foot of a slope running down from the road that passes through the district of Millery, about ten miles from Lyons, a roadmender, attracted by a peculiar smell, discovered the remains of what appeared to be a human body. They were wrapped in a cloth, but so decomposed as to make identification almost impossible. M. Goron, at that time head of the Parisian detective police, believed them to be the remains of Gouffe, but a relative of the missing man, whom he sent to Lyons, failed to identify them. Two days after the discovery of the corpse, there were found near Millery the broken fragments of a trunk, the lock of which fitted a key that had been picked up near the body. A label on the trunk showed that it had been dispatched from Paris to Lyons on July 27, 188-, but the final figure of the date was obliterated. Reference to the books of the railway company showed that on July 27, 1889, the day following the disappearance of Gouffe, a trunk similar in size and weight to that found near Millery had been sent from Paris to Lyons. The judicial authorities at Lyons scouted the idea that either the corpse or the trunk found at Millery had any connection with the disappearance of Gouffe. When M. Goron, bent on following up what he believed to be important clues, went himself to Lyons he found that the remains, after being photographed, had been interred in the common burying-ground. The young doctor who had made the autopsy produced triumphantly some hair taken from the head of the corpse and showed M. Goron that whilst Gouffe’s hair was admittedly auburn and cut short, this was black, and had evidently been worn long. M. Goron, after looking carefully at the hair, asked for some distilled water. He put the lock of hair into it and, after a few minutes’ immersion, cleansed of the blood, grease and dust that had caked them together, the hairs appeared clearly to be short and auburn. The doctor admitted his error. Fortified by this success, Goron was able to procure the exhumation of the body. A fresh autopsy was performed by Dr. Lacassagne, the eminent medical jurist of the Lyons School of Medicine. He was able to pronounce with certainty that the remains were those of the bailiff, Gouffe. An injury to the right ankle, a weakness of the right leg, the absence of a particular tooth and other admitted peculiarities in Gouffe’s physical conformation, were present in the corpse, placing its identity beyond question. This second post-mortem revealed furthermore an injury to the thyroid cartilage of the larynx that had been inflicted beyond any doubt whatever, declared Dr. Lacassagne, before death. There was little reason to doubt that Gouffe had been the victim of murder by strangulation. But by whom had the crime been committed? It was now the end of November. Four months had passed since the bailiff’s murder, and the police had no clue to its perpetrators. At one time a friend of Gouffe’s had been suspected and placed under arrest, but he was released for want of evidence. One day toward the close of November, in the course of a conversation with M. Goron, a witness who had known Gouffe surprised him by saying abruptly, “There’s another man who disappeared about the same time as Gouffe.” M. Goron pricked up his ears. The witness explained that he had not mentioned the fact before, as he had not connected it with his friend’s disappearance; the man’s name, he said, was Eyraud, Michel Eyraud, M. Goron made some inquires as to this Michel Eyraud. He learnt that he was a married man, forty-six years of age, once a distiller at Sevres, recently commission-agent to a bankrupt firm, that he had left France suddenly, about the time of the disappearance of Gouffe, and that he had a mistress, one Gabrielle Bompard, who had disappeared with him. Instinctively M. Goron connected this fugitive couple with the fate of the murdered bailiff. Confirmation of his suspicions was to come from London. The remains of the trunk found at Millery had been skilfully put together and exposed at the Morgue in Paris, whilst the Gouffe family had offered a reward of 500 francs to anybody who could in any way identify the trunk. Beyond producing a large crop of anonymous letters, in one of which the crime was attributed to General Boulanger, then in Jersey, these measures seemed likely to prove fruitless. But one day in December, from the keeper of a boarding-house in Gower Street, M. Goron received a letter informing him that the writer believed that Eyraud and Gabrielle Bompard had stayed recently at his house, and that on July 14 the woman, whom he knew only as “Gabrielle,” had left for France, crossing by Newhaven and Dieppe, and taking with her a large and almost empty trunk, which she had purchased in London. Inquires made by the French detectives established the correctness of this correspondent’s information. An assistant at a trunk shop in the Euston Road was able to identify the trunk — brought over from Paris for the purpose — as one purchased in his shop on July 12 by a Frenchman answering to the description of Michel Eyraud. The wife of the boarding-house keeper recollected having expressed to Gabrielle her surprise that she should buy such an enormous piece of luggage when she had only one dress to put into it. “Oh that’s all right,” answered Gabrielle smilingly, “we shall have plenty to fill it with in Paris!” Gabrielle had gone to Paris with the trunk on July 14, come back to London on the 17th, and on the 20th she and Eyraud returned together to Paris. From these facts it seemed more than probable that these two were the assassins so eagerly sought for by the police, and it seemed clear also that the murder had been done in Paris. But what had become of this couple, in what street, in what house in Paris had the crime been committed? These were questions the police were powerless to answer. The year 1889 came to an end, the murderers were still at large. But on January 21, 1890, M. Goron found lying on his table a large letter bearing the New York postmark. He opened it, and to his astonishment read at the end the signature “Michel Eyraud.” It was a curious letter, but undoubtedly genuine. In it Eyraud protested against the suspicions directed against himself; they were, he wrote, merely unfortunate coincidences. Gouffe had been his friend; he had had no share whatever in his death; his only misfortune had been his association with “that serpent, Gabrielle Bompard.” He had certainly bought a large trunk for her, but she told him that she had sold it. They had gone to America together, he to avoid financial difficulties in which he had been involved by the dishonesty of the Jews. There Gabrielle had deserted him for another man. He concluded a very long letter by declaring his belief in Gabrielle’s innocence — “the great trouble with her is that she is such a liar and also has a dozen lovers after her.” He promised that, as soon as he learnt that Gabrielle had returned to Paris, he would, of his own free will, place himself in the hands of M. Goron. He was to have an early opportunity of redeeming his pledge, for on the day following the receipt of his letter a short, well-made woman, dressed neatly in black, with dyed hair, greyish-blue eyes, good teeth, a disproportionately large head and a lively and intelligent expression of face, presented herself at the Prefecture of Police and asked for an interview with the Prefect. Requested to give her name, she replied, with a smile, “Gabrielle Bompard.” She was accompanied by a middle-aged gentleman, who appeared to be devoted to her. Gabrielle Bompard and her friend were taken to the private room of M. Loze, the Prefect of Police. There, in a half-amused way, without the least concern, sitting at times on the edge of the Prefect’s writing-table, Gabrielle Bompard told how she had been the unwilling accomplice of her lover, Eyraud, in the murder of the bailiff, Gouffe. The crime, she stated, had been committed in No. 3 in the Rue Tronson-Ducoudray, but she had not been present; she knew nothing of it but what had been told her by Eyraud. After the murder she had accompanied him to America; there they had met the middle-aged gentleman, her companion. Eyraud had proposed that they should murder and rob him, but she had divulged the plot to the gentleman and asked him to take her away. It was acting on his advice that she had returned to France, determined to give her evidence to the judicial authorities in Paris. The middle-aged gentleman declared himself ready to vouch for the truth of a great part of this interesting narrative. There they both imagined apparently that the affair would be ended. They were extremely surprised when the Prefect, after listening to their statements, sent for a detective-inspector who showed Gabrielle Bompard a warrant for her arrest. After an affecting parting, at least on the part of the middle-aged gentleman, Gabrielle Bompard was taken to prison. There she soon recovered her spirits, which had at no time been very gravely depressed by her critical situation. According to Eyraud’s letters, if anyone knew anything about Gouffe’s murder, it was Gabrielle Bompard; according to the woman’s statement, it was Eyraud, and Eyraud alone, who had committed it. As they were both liars — the woman perhaps the greater liar of the two — their statements are not to be taken as other than forlorn attempts to shift the blame on to each other’s shoulders. Before extracting from their various avowals, which grew more complete as time went on, the story of the crime, let us follow Eyraud in his flight from justice, which terminated in the May of 1890 by his arrest in Havana. Immediately after the arrest of Gabrielle, two French detectives set out for America to trace and run down if possible her deserted lover. For more than a month they traversed Canada and the United States in search of their prey. The track of the fugitive was marked from New York to San Francisco by acts of thieving and swindling. At the former city he had made the acquaintance of a wealthy Turk, from whom, under the pretence of wishing to be photographed in it, he had borrowed a magnificent oriental robe. The photograph was taken, but Eyraud forgot to return the costly robe. At another time he was lodging in the same house as a young American actor, called in the French accounts of the incident “Sir Stout.” To “Sir Stout” Eyraud would appear to have given a most convincing performance of the betrayed husband; his wife, he said, had deserted him for another man; he raved and stormed audibly in his bedroom, deploring his fate and vowing vengeance. These noisy representations so impressed “Sir Stout” that, on the outraged husband declaring himself to be a Mexican for the moment without funds, the benevolent comedian lent him eighty dollars, which, it is almost needless to add, he never saw again. In narrating this incident to the French detectives, “Sir Stout” describes Eyraud’s performance as great, surpassing even those of Coquelin. Similar stories of theft and debauchery met the detectives at every turn, but, helped in a great measure by the publicity the American newspapers gave to the movements of his pursuers, Eyraud was able to elude them, and in March they returned to France to concert further plans for his capture. Eyraud had gone to Mexico. From there he had written a letter to M. Rochefort’s newspaper, L’Intransigeant, in which he declared Gouffe to have been murdered by Gabrielle and an unknown. But, when official inquiries were made in Mexico as to his whereabouts, the bird had flown. At Havana, in Cuba, there lived a French dressmaker and clothes-merchant named Puchen. In the month of February a stranger, ragged and unkempt, but evidently a fellow-countryman, visited her shop and offered to sell her a superb Turkish costume. The contrast between the wretchedness of the vendor and the magnificence of his wares struck Madame Puchen at the time. But her surprise was converted into suspicion when she read in the American newspapers a description of the Turkish garment stolen by Michel Eyraud, the reputed assassin of the bailiff Gouffe. It was one morning in the middle of May that Mme. Puchen read the description of the robe that had been offered her in February by her strange visitor. To her astonishment, about two o’clock the same afternoon, she saw the stranger standing before her door. She beckoned to him, and asked him if he still had his Turkish robe with him; he seemed confused, and said that he had sold it. The conversation drifted on to ordinary topics; the stranger described some of his recent adventures in Mexico. “Oh!” exclaimed the dressmaker, “they say Eyraud, the murderer, is in Mexico! Did you come across him? Were you in Paris at the time of the murder?” The stranger answered in the negative, but his face betrayed his uneasiness. “Do you know you’re rather like him?” said the woman, in a half-joking way. The stranger laughed, and shortly after went out, saying he would return. He did return on May 15, bringing with him a number of the Republique Illustree that contained an almost unrecognisable portrait of Eyraud. He said he had picked it up in a cafe. “What a blackguard he looks!” he exclaimed as he threw the paper on the table. But the dressmaker’s suspicions were not allayed by the stranger’s uncomplimentary reference to the murderer. As soon as he had gone, she went to the French Consul and told him her story. By one of those singular coincidences that are inadmissable in fiction or drama, but occur at times in real life, there happened to be in Havana, of all places, a man who had been employed by Eyraud at the time that he had owned a distillery at Sevres. The Consul, on hearing the statement of Mme. Puchen, sent for this man and told him that a person believed to be Eyraud was in Havana. As the man left the Consulate, whom should he meet in the street but Eyraud himself! The fugitive had been watching the movements of Mme. Puchen; he had suspected, after the interview, that the woman would denounce him to the authorities. He now saw that disguise was useless. He greeted his ex-employe, took him into a cafe, there admitted his identity and begged him not to betray him. It was midnight when they left the cafe. Eyraud, repenting of his confidence, and no doubt anxious to rid himself of a dangerous witness, took his friend into an ill-lighted and deserted street; but the friend, conscious of his delicate situation, hailed a passing cab and made off as quickly as he could. Next day, the 20th, the search for Eyraud was set about in earnest. The Spanish authorities, informed of his presence in Havana, directed the police to spare no effort to lay hands on him. The Hotel Roma, at which he had been staying, was visited; but Eyraud, scenting danger, had gone to an hotel opposite the railway station. His things were packed ready for flight on the following morning. How was he to pass the night? True to his instincts, a house of ill-fame, at which he had been entertained already, seemed the safest and most pleasant refuge; but, when, seedy and shabby, he presented himself at the door, he was sent back into the street. It was past one in the morning. The lonely murderer wandered aimlessly in the streets, restless, nervous, a prey to apprehension, not knowing where to go. Again the man from Sevres met him. “It’s all up with me!” said Eyraud, and disappeared in the darkness. At two in the morning a police officer, who had been patrolling the town in search of the criminal, saw, in the distance, a man walking to and fro, seemingly uncertain which way to turn. Hearing footsteps the man turned round and walked resolutely past the policeman, saying good-night in Spanish. “Who are you? What’s your address?” the officer asked abruptly. “Gorski, Hotel Roma!” was the answer. This was enough for the officer. Eyraud was know[n] to have passed as “Gorski,” the Hotel Roma had already been searched as one of his hiding-places. To seize and handcuff “Gorski” was the work of a moment. An examination of the luggage left by the so-called Gorski at his last hotel and a determined attempt at suicide made by their prisoner during the night proved conclusively that to the Spanish police was the credit of having laid by the heels, ten months after the commission of the crime, Michel Eyraud, one of the assassins of the bailiff Gouffe. On June 16 Eyraud was delivered over to the French police. He reached France on the 20th, and on July 1 made his first appearance before the examining magistrate. It will be well at this point in the narrative to describe how Eyraud and Gabrielle Bompard came to be associated together in crime. Gabrielle Bompard was twenty-two years of age at the time of her arrest, the fourth child of a merchant of Lille, a strong, hardworking, respectable man. Her mother, a delicate woman, had died of lung disease when Gabrielle was thirteen. Even as a child lying and vicious, thinking only of men and clothes, Gabrielle, after being expelled as incorrigible from four educational establishments, stayed at a fifth for some three years. There she astonished those in authority over her by her precocious propensity for vice, her treacherous and lying disposition, and a lewdness of tongue rare in one of her age and comparative inexperience. At eighteen she returned to her father’s house, only to quit it for a lover whom, she alleged, had hypnotised and then seduced her. Gabrielle was singularly susceptible to hypnotic suggestion. Her father implored the family doctor to endeavour to persuade her, while in the hypnotic state, to reform her deplorable conduct. The doctor did his best but with no success. He declared Gabrielle to be a neuropath, who had not found in her home such influences as would have tended to overcome her vicious instincts. Perhaps the doctor was inclined to sympathise rather too readily with his patient, if we are to accept the report of those distinguished medical gentlemen who, at a later date, examined carefully into the mental and physical characteristics of Gabrielle Bompard. This girl of twenty had developed into a supreme instance of the “unmoral” woman, the conscienceless egoist, morally colour-blind, vain, lewd, the intelligence quick and alert but having no influence whatever on conduct. One instance will suffice to show the sinister levity, the utter absence of all moral sense in this strange creature. Such callousness is almost unsurpassed in the annals of criminal insensibility. Nero fiddling over burning Rome, Thurtell fresh from the murder of Weare, inviting Hunt, the singer and his accomplice, to “tip them a stave” after supper, Edwards, the Camberwell murderer, reading with gusto to friends the report of a fashionable divorce case, post from the murder of a young married couple and their baby — even examples such as these pale before the levity of the “little demon,” as the French detectives christened Gabrielle. Such was Gabrielle Bompard when, on July 26, exactly one year to a day before the murder of Gouffe, she met in Paris Michel Eyraud. These two were made for each other. If Gabrielle were unmoral, Eyraud was immoral. Forty-six at the time of Gouffe’s murder, he was sufficiently practised in vice to appreciate and enjoy the flagrantly vicious propensities of the young Gabrielle. All his life Eyraud had spent his substance in debauchery. His passions were violent and at times uncontrollable, but unlike many remarkable men of a similar temperament, this strong animalism was not in his case accompanied by a capacity for vigorous intellectual exertion or a great power of work. “Understand this,” said Eyraud to one of the detectives who brought him back to France, “I have never done any work, and I never will do any work.” To him work was derogatory; better anything than that. Unfortunately it could not be avoided altogether, but with Eyraud such work as he was compelled at different times to endure was only a means for procuring money for his degraded pleasures, and when honest work became too troublesome, dishonesty served in its stead. When he met Gabrielle he was almost at the end of his tether, bankrupt and discredited. At a pinch he might squeeze a little money out of his wife, with whom he continued to live in spite of his open infidelities. Save for such help as he could get from her small dowry, he was without resources. A deserter from the army during the Mexican War in 1869, he had since then engaged in various commercial enterprises, all of which had failed, chiefly through his own extravagance, violence and dishonesty. Gabrielle was quick to empty his pockets of what little remained in them. The proceeds of her own immorality, which Eyraud was quite ready to share, soon proved insufficient to replenish them. Confronted with ruin, Eyraud and Gompard hit on a plan by which the woman should decoy some would-be admirer to a convenient trysting-place. There, dead or alive, the victim was to be made the means of supplying their wants. On further reflection dead seemed more expedient than alive, extortion from a living victim too risky an enterprise. Their plans were carefully prepared. Gabrielle was to hire a ground-floor apartment, so that any noise, such as footsteps or the fall of a body, would not be heard by persons living underneath. At the beginning of July, 1889, Eyraud and Bompard were in London. There they bought at a West End draper’s a red and white silk girdle, and at a shop in Gower Street a large travelling trunk. They bought, also in London, about thirteen feet of cording, a pulley and, on returning to Paris on July 20, some twenty feet of packing-cloth, which Gabrielle, sitting at her window on the fine summer evenings, sewed up into a large bag. The necessary ground-floor apartment had been found at No. 3 Rue Tronson-Ducoudray. Here Gabrielle installed herself on July 24. The bedroom was convenient for the assassins’ purpose, the bed standing in an alcove separated by curtains from the rest of the room. To the beam forming the crosspiece at the entrance into the alcove Eyraud fixed a pulley. Through the pulley ran a rope, having at one end of it a swivel, so that a man, hiding behind the curtains could, by pulling the rope strongly, haul up anything that might be attached to the swivel at the other end. It was with the help of this simple piece of mechanism and a good long pull from Eyraud that the impecunious couple hoped to refill their pockets. The victim was chosen on the 25th. Eyraud had already known of Gouffe’s existence, but on that day, Thursday, in a conversation with a common friend, Eyraud learnt that the bailiff Gouffe was rich, that he was in the habit of having considerable sums of money in his care, and that on Friday nights Gouffe made it his habit to sleep from home. There was no time to lose. The next day Gabrielle accosted Gouffe as he was going to his dejeuner and, after some little conversation agreed to meet him at eight o’clock that evening. 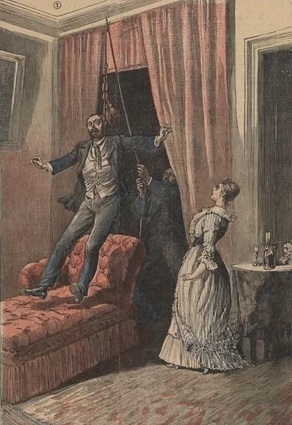 Detail view (click for the full four-panel image) of Le Petit Journal‘s illustration of Bompard and Eyraud murdering Gouffe. 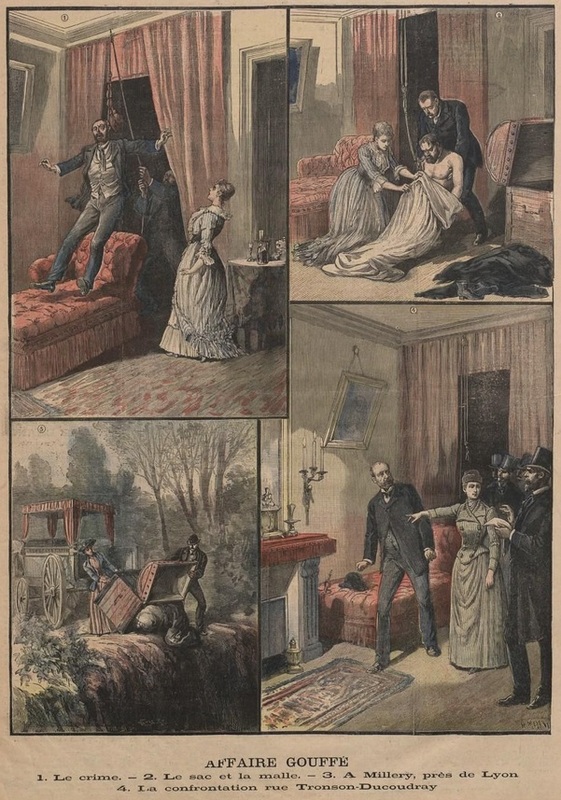 Via this collection of 1890-91 French news about the crime. At six o’clock Eyraud and Bompard dined together, after which Eyraud returned to the apartment, whilst Bompard went to meet Gouffe near the Madeline Church. What occurred afterwards at No. 3 Rue Tronson-Ducoudray is best described in the statement made by Eyraud at his trial. She then sat on his knee and, as if in play, slipped the cord round his neck; then putting her hand behind him, she fixed the end of the cord into the swivel, and said to him laughingly, ‘What a nice necktie it makes!’ That was the signal. Eyraud pulled the cord vigorously and, in two minutes, Gouffe had ceased to live. The next day Eyraud, after saying good-bye to his wife and daughter, left with Gabrielle for Lyons. On the 28th they got rid at Millery of the body of Gouffe and the trunk in which it had travelled; his boots and clothes they threw into the sea at Marseilles. There Eyraud borrowed 500 francs from his brother. Gabrielle raised 2,000 francs in Paris, where they spent August 18 and 19, after which they left for England, and from England sailed for America. During their short stay in Paris Eyraud had the audacity to call at the apartment in the Rue Tronson-Ducoudray for his hat, which he had left behind; in the hurry of the crime he had taken away Gouffe’s by mistake. Eyraud had been brought back to Paris from Cuba at the end of June, 1890. Soon after his return, in the room in which Gouffe had been done to death and in the presence of the examining magistrate, M. Goron, and some fifteen other persons, Eyraud was confronted with his accomplice. Each denied vehemently, with hatred and passion, the other’s story. Neither denied the murder, but each tried to represent the other as the more guilty of the two. Eyraud said that the suggestion and plan of the crime had come from Gabrielle; that she had placed around Gouffe’s neck the cord that throttled him. Gabrielle attributed the inception of the murder to Eyraud, and said that he had strangled the bailiff with his own hands. Eyraud, since his return, had seemed indifferent to his own fate; whatever it might be, he wished that his mistress should share it. He had no objection to going to the guillotine as long as he was sure that Gabrielle would accompany him. She sought to escape such a consummation by representing herself as a mere instrument in Eyraud’s hands. It was even urged in her defence that, in committing the crime, she had acted under the influence of hypnotic suggestion on the part of her accomplice. Three doctors appointed by the examining magistrate to report on her mental state came unanimously to the conclusion that, though undoubtedly susceptible to hypnotic suggestion, there was no ground for thinking that she had been acting under such influence when she participated in the murder of Gouffe. Intellectually the medical gentlemen found her alert and sane enough, but morally blind. The trial of Eyraud and Bompard took place before the Paris Assize Court on December 16, 1890. It had been delayed owing to the proceedings of an enterprising journalist. The names of the jurymen who were to be called on to serve at the assize had been published. The journalist conceived the brilliant idea of interviewing some of these gentlemen. He succeeded in seeing four of them, but in his article which appeared in the Matin newspaper said that he had seen twenty-one. Nine of them, he stated, had declared themselves in favour of Gabrielle Bompard, but in some of these he had discerned a certain “eroticism of the pupil of the eye” to which he attributed their leniency. A month’s imprisonment was the reward of these flights of journalistic imagination. A further scandal in connection with the trial was caused by the lavish distribution of tickets of admission to all sorts and kinds of persons by the presiding judge, M. Robert, whose occasional levities in the course of the proceedings are melancholy reading. As a result of his indulgence a circular was issued shortly after the trial by M. Fallieres, then Minister of Justice,* limiting the powers of presidents of assize in admitting visitors into the reserved part of the court. The proceedings at the trial added little to the known facts of the case. Both Eyraud and Bompard continued to endeavour to shift the blame on to each other’s shoulders. A curious feature of the trial was the appearance for the defence of a M. Liegeois, a professor of law at Nancy. To the dismay of the Court, he took advantage of a clause in the Code of Criminal Instruction which permits a witness to give his evidence without interruption, to deliver an address lasting four hours on hypnotic suggestion. He undertook to prove that, not only Gabrielle Bompard, but Troppmann, Madame Weiss, and Gabrielle Fenayrou also, had committed murder under the influence of suggestion.† In replying to this rather fantastic defence, the Procureur-General, M. Quesnay de Beaurepaire, quoted a statement of Dr. Brouardel, the eminent medical jurist who had been called for the prosecution, that “there exists no instance of a crime, or attempted crime committed under the influence of hypnotic suggestion.” As to the influence of Eyraud over Bompard, M. de Beaurepaire said: “The one outstanding fact that has been eternally true for six thousand years is that the stronger will can possess the weaker: that is no peculiar part of the history of hypnotism; it belongs to the history of the world. Dr. Liegeois himself, in coming to this court to-day, has fallen a victim to the suggestion of the young advocate who has persuaded him to come here to air his theories.” The Court wisely declined to allow an attempt to be made to hypnotise the woman Bompard in the presence of her judges, and M. Henri Robert, her advocate, in his appeal to the jury, threw over altogether any idea of hypnotic suggestion, resting his plea on the moral weakness and irresponsibility of his client. In sheer wickedness there seems little enough to choose between Eyraud and Bompard. But, in asking a verdict without extenuating circumstances against the woman, the Procureur-General was by no means insistent. He could not, he said, ask for less, his duty would not permit it: “But I am ready to confess that my feelings as a man suffer by the duty imposed on me as a magistrate. On one occasion, at the outset of my career, it fell to my lot to ask from a jury the head of a woman. I felt then the same kind of distress of mind I feel to-day. The jury rejected my demand; they accorded extenuating circumstances; though defeated, I left the court a happier man. What are you going to do to-day, gentlemen? It rests with you. What I cannot ask of you, you have the right to accord. But when the supreme moment comes to return your verdict, remember that you have sworn to judge firmly and fearlessly.” The jury accorded extenuating circumstances to the woman, but refused them to the man. After a trial lasting four days Eyraud was sentenced to death, Bompard to twenty years penal servitude. At first Eyraud appeared to accept his fate with resignation. He wrote to his daughter that he was tired of life, and that his death was the best thing that could happen for her mother and herself. But, as time went on and the efforts of his advocate to obtain a commutation of his sentence held out some hope of reprieve, Eyraud became more reluctant to quit the world. But his hopes were to be disappointed. The Court of Cassation rejected his appeal. A petition was addressed to President Carnot, but, with a firmness that has not characterised some of his successors in office, he refused to commute the sentence. On the morning of February 3, 1891, Eyraud noticed that the warders, who usually went off duty at six o’clock, remained at their posts. An hour later the Governor of the Roquette prison entered his cell, and informed him that the time had come for the execution of the sentence. Eyraud received the intelligence quietly. The only excitement he betrayed was a sudden outburst of violent animosity against M. Constans, then Minister of the Interior. Eyraud had been a Boulangist, and so may have nourished some resentment against the Minister who, by his adroitness, had helped to bring about the General’s ruin. Whatever his precise motive, he suddenly exclaimed that M. Constans was his murderer: “It’s he who is having me guillotined; he’s got what he wanted; I suppose now he’ll decorate Gabrielle!” He died with the name of the hated Minister on his lips. On this date in 1891, middle-aged widower James M. Eubanks was hanged in the yard of the county jail in San Jose, California. He’d killed his oldest daughter, Ada, thirteen months before. Ada was fifteen years old at the time of her death, and worked as a waitress at a restaurant called Heath House in Los Gatos. Her relationship with her father was troubled and James was often abusive towards her. Once, the girl’s uncle had to intervene when he saw James chasing after Ada brandishing a stick. There were hints of something more than typical inter-generational tension and teenage rebellion in the Eubanks family, however. Ada confided to a female relative that her father had committed “improper actions” that caused a great deal of trouble for her, and there were rumors that she had been pregnant by her own father. Three days before Christmas in 1889, Ada was at work at Heath House and her father was loitering at the saloon next door. He’d taken a position at the upstairs window, which afforded him a view of the Heath House kitchen, and was sullenly eyeballing his daughter. Between nine and ten in the morning, James left his surveillance point carrying a double barreled shotgun. He came into the restaurant through the kitchen door and called for Ada. When she came to the door, he took aim and fired, hitting her in the chest and killing her instantly. James then fired a shot at his own head, but missed. He calmly walked back into the saloon, ordered a drink of whiskey, consumed it and went back upstairs. There he tried to cut his throat with a razor, but inflicted only a minor wound before the constable came and arrested him. Admitting to the slaying, the “drunken, worthless wretch” said he’d been angry because Ada refused to turn over her earnings from her job. At his trial, Eubanks’s lawyer presented a defense of diminished capacity: he admitted he’d fatally shot his daughter, but said that “from the long and excessive use of intoxicating liquors … he was, at the time of the homicide, and for a long time prior thereto, of a weak and enfeebled mind” and therefore incapable of forming the malice aforethought necessary for a first-degree murder conviction. His attorney argued for a conviction of second-degree murder, or at least a recommendation of mercy. He found religion on death row, like so many others of his kind, and said he believed God had forgiven him and he would go to Heaven. Sheriff Giles E. McDougall‘s duty required him to preside over the hanging, and he was sickened by the experience. He lobbied for a change in California law — going so far as to write to every county sheriff in the state to solicit support — so that executions would fall within the confines of the state prison system and would no longer be the responsibility of individual counties. McDougall got his new law within a year. On this date in 1891, U.S. President Benjamin Harrison settled a death penalty case from the remote Navassa Island by granting a commutation. Back in the 19th century, islands stacked high with guano were worth their weight in bird crap. The phosphate-rich dung piled meters-deep in some places, and could be mined for agricultural fertilizer and for use in gunpowder and explosives. In 1856, Congress even passed a Guano Islands Act empowering skippers to plant the stars and stripes on any of these lucrative little turd reefs they happened to run across. That’s how the U.S. came to possess, for instance, Midway Island … and more than 100 other islands as well. For audio product handling the guano binge, try this 99 Percent Invisible podcast. Most of these claims have long since been ceded, but a few remain today. One of them is (still!) Navassa, a three-square-mile speck off the coast of Haiti, 100 miles south of Guantanamo Bay. But in the late 19th century, its sweet, sweet guano was being extracted by a Baltimore-based firm known as the Navassa Phosphate Company. This operation employed 137 African-American laborers, moving groaning shitloads of product by raw muscle power under a blistering tropical sun … and under 11 white overseers. The nature of the assignment — an island very far from the nearest American settlement, with no other industry, community or outpost to repair to — made taking a job on Navassa almost like hitching on somewhere as a sailor: you were off to a little floating dictatorship, with no way out until the end of the contract. Navassa’s overseers turned out to have a taste for the cat o’nine tails, and worse. “The conditions surrounding the prisoners and their fellows were of a most peculiar character,” Harrison noted in his eventual commutation order. They were American citizens, under contracts to perform labor upon specified terms, within American territory, removed from any opportunity to appeal to any court or public officer for redress of any injury or the enforcement of any civil right. Their employers were, in fact, their masters. The bosses placed over them imposed fines and penalties without any semblance of trial. These penalties extended to imprisonment, and even to the cruel practice of tricing men up for a refusal to work. Escape was impossible, and the state of things generally such as might make men reckless and dangerous. Or, as a naval inspection judged it, Navassa resembled “a convict establishment without its comforts and cleanliness”: people being worked brutally to the bone during their contract, eating rancid rations and living in filth. Not surprisingly, Navassa’s “convict” laboring population rebelled in 1889, and in a vicious hour-long riot slew five overseers while maiming several others. However, a huge clemency push spearheaded by the Baltimore-based black fraternal organization the Grand United Order of Galilean Fishermen raised the cry to spare the condemned men. Guano harvesting resumed after the riot, but was aborted in 1898 by the Spanish-American War; the Navassa Phosphate Company fell into bankruptcy, and although the U.S. later threw up a lighthouse on Navassa to aid Panama Canal-bound vessels, it’s been effectively uninhabited ever since. * The appeals arising from the Navassa conviction generated the 1890 Supreme Court case Jones v. United States, affirming Navassa’s American territoriality, and establishing Congressional jurisdiction over violations of U.S. law that didn’t take place in any particular state. This bit of jurisprudence has turned up all over the place in the century-plus since it was issued. After its famously inauspicious debut the previous summer, this date in 1891 marked the second, third, fourth and fifth uses of New York’s pioneering electric chair. Having grotesquely botched its maiden execution of William Kemmler, there was a considerable sentiment to retire the electric chair immediately. The second round of “electrocutions” — 19th century papers still put this then-neologism in quotes — were closely watched as an acidelectric test of the chair’s staying-power. If these men burned to death, slowly and horribly, as Kemmler had, that might have been it. And had New York reverted to hanging or moved on to lethal injection,* the chair’s subsequent adoption by other states and its journey into the iconic popular culture would likely have been aborted. But, they fixed up the chair, tested it on some more large animals, and moved the electrode combination from head+spine to head+leg … and voila! “Unconcealed” pride would be an interesting choice for these advocates, since these prophets of brave new death technology had themselves feared a calamitous failure of their apparatus as much as anybody — well, as much as anybody except the condemned. every witness of the execution was made to pledge himself in writing never to reveal any detail of it unless requested to do so by the authorities. No newspaper representative was admitted. As THE TIMES has repeatedly stated, it was the intention of the advocates of the law to keep the public from knowing anything about these executions … Therefore, Gov. Hill** and his henchman, Warden Brown, made up their minds that these experiments with the law should not go before the public as anything else than successes, and they packed the jury accordingly with picked men. The Times dilates considerably in this vein; ever the helpful courtier, it is concerned principally that the state’s orchestrated public relations campaign would have had more credibility had the successful executions been witnessed by third parties who have newspapers to sell. You know? But … if only the state’s handpicked friendly witnesses were allowed to see what went down, do we actually know that it wasn’t another dog’s breakfast? The July 8, 1891 London Times — for the executions had a global audience — cobbled together a less reassuring wire report. There are, however, many conflicting statements current as to what actually occurred, and it is extremely difficult to discriminate as to which are true and which are false … Dr. Daniels, one of the witnesses of the executions this morning, said, in an interview this afternoon, that he might tell a great deal about the affair if he were not bound to silence. He added that the Kemmler scene was practically repeated in each case, there having been two shocks given to each of the condemned men. The truth, Dr. Daniels said, would make a thrilling story. If Dr. Daniels actually said anything like that, someone got this electric chair proponent rewrite (pdf) pretty quickly. I was misquoted. I simply said that if I were at liberty to give a detailed account of the scenes in the death chamber the public would no doubt be interested in knowing that the executions had been a pronounced success. You could totally see how the guy would say “pronounced success”, and this British rag would hear, “the Kemmler scene was practically repeated in each case.” Separated by a common language and all that. History has all but forgotten them … save that their deaths were officially ruled a great technological triumph, sufficient to rescue “the chair” from abortive 19th century penal cul-de-sac and set it on its way to becoming a pop culture icon. * The modern-seeming method of lethal injection was actually one of the options vetted to replace the rope in the 1880s. ** Hill at this time was flirting with a presidential run, which ultimately didn’t happen: he won a Senate seat instead. † Thanks to @LisaWinston for the tip to Slocum’s sports career. SANTA BARBARA, Oct. 20 — [By the Associated Press.] Mary Dezirello, aged 22 years, was shot and instantly killed this morning at 10 o’clock by Ramon Lopez, a Spaniard, aged 38 years. Lopez has been bothering the girl with his attentions for some time past, and had made threats of violence against her, declaring that if she did not marry him she should not marry anyone. This morning he called at her father’s residence and called her out to the gate. He wanted to make up with her. She refused to have anything to do with him, when he pulled a big Colt’s revolver and shot her through the body. She died almost instantly. Lopez then shot twice at himself, without effect, and then walked away. Shortly afterwards an officer came up and went toward Lopez’s house, which is in the same block. Lopez fired three shots at the officer without effect and was then arrested and locked up. Threats of lynching were so strongly made that this afternoon the murderer was taken to Ventura for safe keeping. SANTA BARBARA, Oct. 21 — [By the Associated Press.] A vigilance committee was formed here yesterday to avenge the death of Mary Dezirello, the young girl who was murdered early yesterday morning by Ramon Lopez, because she refused to accept the latter’s attentions. 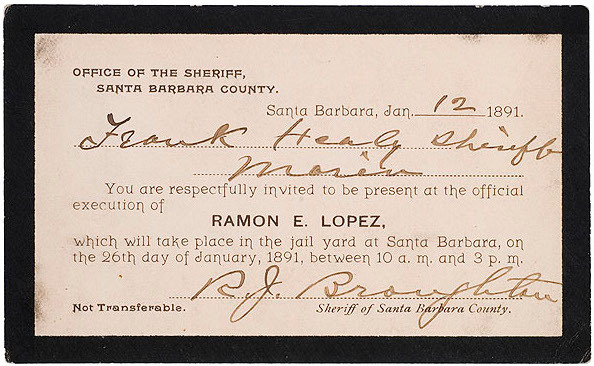 The prisoner was taken to Ventura during the afternoon, but the committee did not believe this and last night over one hundred men visited the County Jail and demanded that Lopez be delivered to them. The keys were given to the leader and the jail and courthouse searched, but the murdered [sic] was not found. The feeling against Lopez is at fever heat, and it is reported that members of the Vigilance Committee have sworn to hang him. The officers in Ventura feared that the crowd would go there to take the prisoner, and this morning Lopez and Edwardo Espinosa, another Santa Barbara murderer, were placed on a train at Ventura and taken to Los Angeles for safe-keeping. It is reported here tonight that the mother of the murdered girl is dying on account of the tragedy, and that her father is nearly crazed. SANTA BARBARA (Cal.) Jan. 25 — [Special.] This was the last day for Ramon Lopez on this terrestrial sphere. Tomorrow, at some time between the hours of 10 and 3, he will be hanged in the jail-yard here for the murder of pretty Mary Dezirello in October last. Everything is in readiness and the rope has been thoroughly tested. He has spent much of the day in company with a priest. Sheriff Broughton opened the gates to the jail-yard yesterday and today, and hundreds availed themselves of the opportunity to see a scaffold ready for the hangman. There is considerable suppressed excitement over the event. Lopez eats heartily and is cool and quiet. Several peace officers from adjoining counties are already in the city for the purpose of witnessing the execution. SANTA BARBARA, Jan. 26 — [Special.] Another life has been snuffed out in obedience to the mandates of the law. Ramon E. Lopez was executed on the gallows here today by the Sheriff of this county in a most expeditious and faultless manner. People who have witnessed a large number of executions say that they never saw anything of the kind so perfectly accomplished. The sentence of Lopez said that he should be hanged by the neck until dead some time between the hours of 10 a.m. and 3 p.m. of today. Sheriff Broughton had not given out what would be the exact time of the hanging. By 10 o’clock, however, a large number of curious people, including a few women, were on the grounds, some of whom, of course, held permits which were to admit the bearers of the jail yard. About this time it was rumored around that the execution would be at 11 o’clock. through the aperture beneath him, a distance of six and a half feet, and there he remained suspended for fifteen minutes, during which time not one tremor or convulsion of any kind was discernable. His neck had been dislocated by the fall, and he moved not a muscle. The body vibrated very slightly but did not turn round, and remained exactly was when it dropped. This was considered very remarkable by the crowd. The knot, which had been placed under the left ear, by some means slipped around almost under the center of the chin. At the end of the time mentioned the corpse was lowered into a coffin and was taken away by a local undertaker. Two physicians took turns testing the heart’s action and one of them reported to the Sheriff that “the prisoner is dead” at the end of the fifteenth minute. which shone in uninterrupted rays upon him. This was his only voluntary act while on the platform, except kissing the cross, which the priest placed to his lips. The rest of the time he stood perfectly still with his eyes closed, and was apparently the most composed man on the platform. SANTA BARBARA, Jan. 26 — [Special.] For days and days almost the sole topic of conversation here among all classes has been the forthcoming execution of Ramon E. Lopez. This was partly the result of the extraordinary nature of his crime, for which he has suffered death, and partly from the fact that it is the first legal execution ever held in the county. During these days of discussion the condemned man has occupied a small cell upstairs in the county jail, under the eyes of the “death watch,” pacing up and down in his small room or lying stretched out on his cot, conversing with the attendants or an occasional visitor, or playing on his favorite instrument — the guitar. I learn that Lopez was a man of considerable intellectual attainments, being especially well versed in the history of his own and contemporary nations. He was a natural mechanic of unusual skill. He had worked at the blacksmith’s trade, but of late years was principally engaged in repairing complicated machinery, including watches and clocks. He was born and raised in this city and was 38 years of age. He has relatives in Los Angeles, Ventura and San Jose. The murder he committed was among the most atrocious and inexcusable known to the annals of crime. About 8 o’clock in the morning of October 20, last, he called at the home of his victim in one of the principal residence streets of this city, summoned her to his side, and without even the pretext of a personal quarrel, shot her down on the spot. She was his sweetheart, and they had been engaged to be married. Her parents were opposed to the match and she felt compelled to break off the engagement, and for this she lost her life! Her name was Mary Dezirello, and she was young, beautiful, and accomplished. The reading public will probably remember the frantic attempts of a mob which came near lynching the murderer, and of his being spirited away by the officers to Ventura, and later to Los Angeles, in order to save his neck. He remained in the Los Angeles County Jail for a month and was then returned to this city. He was tried in December last and promptly convicted of murder in the first degree, the jury occupying only twenty minutes in finding a verdict. But this was not his only crime. He killed Henry Heldt in Los Angeles in 1883, in a row at a dance, and got three years at San Quentin for manslaughter, but was pardoned out a few years since by Gov. Stoneman. Lopez has not been guilty of any of the smaller vices so common to murderers. On the contrary, he has generally led a quiet, peaceable and industrious life, but has always been known to possess an ungovernable temper. During the last few days of his life he was under the almost constant tutorage of his father confessor. His prison life has otherwise been quiet and uneventful. A few Christian ladies did, occasionally, visit him and pray and sing in his presence. He was always attentive and respectful to them, and generally asked them to return again. There has been a notable lack of that sickly sentimentality in his case so often displayed by the morbid and curious. It may be worth while to state that after the murder, and before he left the spot, Lopez fired two shots over his own head as if to take his own life; but he seems to have exercised considerable caution in doing so, since neither of the shots took effect. All those desiring to marry a certain girl might be on the lookout, as their steps, manners and customs will be made known through the press next week in a historical point of view. This was no doubt meant for a threat against any gentleman who might sue for the girl’s hand in marriage. The scaffold, which was erected in a corner of the jail yard, has been ready since Friday last, and has been viewed by hundreds of people who were admitted to the premises by the Sheriff. The framework and platform of this scaffold was made in San Bernardino several years ago and its first service was in the case of the murderer McDowell, about the year 1883. Since that time it has done yeoman’s service in “removing” Silvas and Martinez in Los Angeles. It was also got in readiness to add dramatic effect to the taking off of one [Fritz] Anschlag, but that accomplished butcher chose his own method of quitting the earth, and cheated this useful instrument. It was shipped here from Los Angeles several days ago, and althrough it looks a little scarred and weather-beaten, seems sufficient for much substantial service in behalf of good society yet. 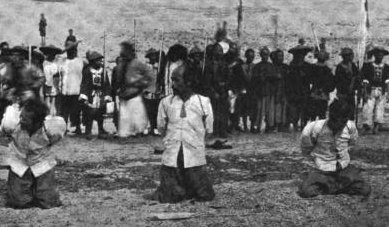 On this date in 1891, Chinese authorities beheaded 15 at Kowloon, including the leaders of the then-notorious Namoa pirates. 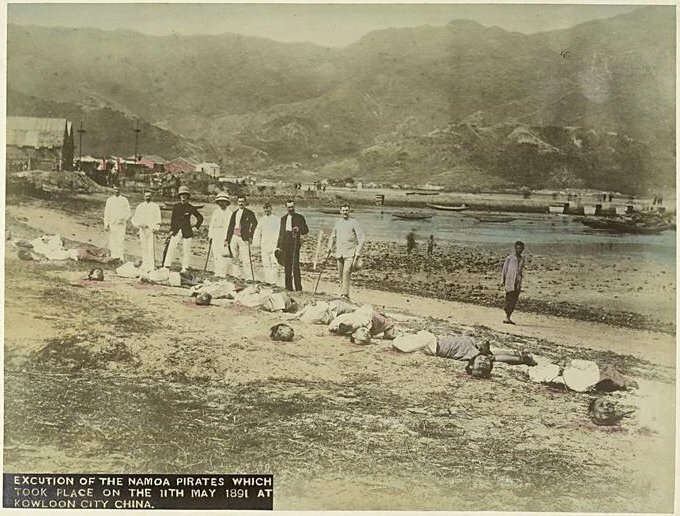 The most daring and disastrously successful piracy of late years … was the “Namoa” piracy in 1890. The startling news of this outrage created a general feeling of unsafety and consternation among the foreign communities in China, mingled with grief and just resentment for the cold-blooded murder of Captain Pocock and Mr. Petersen, both most popular and respected men, the latter being a member of the Customs Service. On Sunday, the 3rd of December, 1890, the Douglas, Lapraik, and Co‘s coasting steamer, “Namoa,” commanded by my late most esteemed friend Capt. Pocock,* left Hongkong at noon, bound on her usual trip up the coast to Swatow, Amoy, and Foochow with several European and a large number of Chinese passengers, most of the latter being Fuhkien people returning to their native homes after many years absence in the United States and California, each with his little hoard of hard-earned dollars, gained by a small lifetime of frugal toil and self-denial in a distant land. These poor men were nearing their well-remembered haunts of earlier days, to once more spend among the relations and friends of their youth the fast-approaching New Year. Several Chinese passengers [during the voyage] came up out of the main between-decks and walked about for some minutes in a seemingly aimless manner; then others emerged from the hatch, until there were between forty and fifty on deck — some forward near the hatchway leading down to the junior officers’ mess, others near the bridge ladder and entrance to engine-room and stokehole, and the rest at the main hatchway, saloon entrances and after skylight. Suddenly, at a given signal, off came their loose outer garments, and these harmless-looking passengers were armed men; each with a cutlass and two revolvers in hand, and at their appointed stations. The ship was now entirely in the hands of the pirates, whose leader placed one of the gang at the helm, with directions to steer a certain course. The attack had been planned and carried out with consummate tact and forethought, for the pirates were old hands — desperate scoundrels … two or three ventured below … among their terror-stricken countrymen, and ransacked their luggage, robbing them of their treasured packets of dollars, saved during long and lonesome years of comparative exile and drudgery. Every cent was taken from these poor fellows, who wept in vain, and heart-rending scenes ensued. But the wretches took all. Then [the European passengers] were all driven into the captain’s little berth, which was barely large enough to hold them all, where they were nearly suffocated. At this point, the pirates steam off to rendezvous with their confederates, transfer their persons and their booty to the getaway ships, and — after debating whether to burn the Namoa — instead abandon the ship unsunk and the hostages unkilled. These put the ship to rights and got it back to Hong Kong. Public indignation was great, and considerable pressure was brought to bear on the Chinese Government to bring the pirates to justice. Skilled foreign and Chinese detectives were sent out on their track, doggedly determined to run these criminals to earth and make them pay the full penalty of their dastardly deeds. For some time great precautions were taken by the captains and officers of coasting steamers to search the luggage of all native passengers, and thus guard against a similar catastrophe. * Captain Thomas Guy Pocock was killed by the pirates, and has a private memorial in Hong Kong Cemetery (aka Happy Valley Cemetery). He left a one-year-old son who died in World War I. 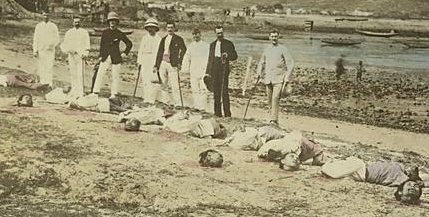 ** According to a tome on legal administration in Hong Kong, the pirates were beheaded in batches mixed in with other criminals. 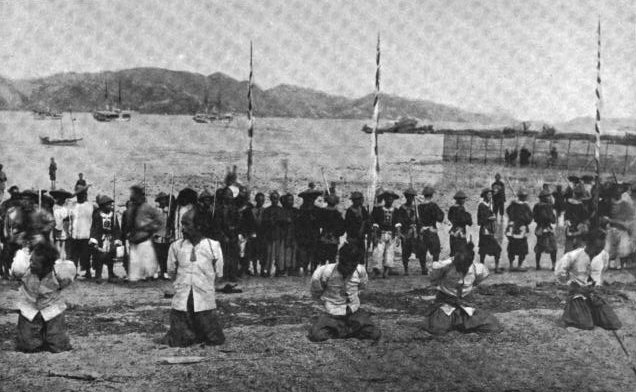 A wholesale execution took place at Kowloon City on the 17th April, 1891, when nineteen pirates were decapitated, thirteen of them for participating in the Namoa and other piracies, and six others for various offences in Chinese territory … on the 11th May fifteen more prisoners were beheaded at Kowloon by the Chinese authorities, amongst the number being six Namoa pirates, including the three leaders of the gang, one of the men being the captain of the junks on board which the pirates put their plunder … One of the leaders decapitated, named Lai A Tsat, was a man whose boldness and cunning in carrying out piracies had long made him a terror both at sea and on shore.